I wrote a POST RECENTLY about things which were currently inspiring my projects. Along with illustrations from the Madeline series, it also included a gorgeous chair and an antique mirror. 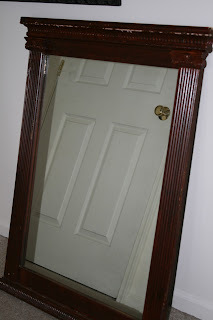 I purchased this mirror at a local antique shop (which I *love*) a few weeks ago. I was talking the project over with the owner of the shop, who is an absolutely wonderful woman. She was selling the mirror for $25, which was SUCH a steal and I had to question her about it. She said the reason for the price tag was due to the shape of the mirror. When this came to me, it actually looked quite a bit worse than the picture shows. There were chunks missing from the back and the molding on the front was chipped to an oblivion. Just the sort of challenge I love. (1) Clean it. 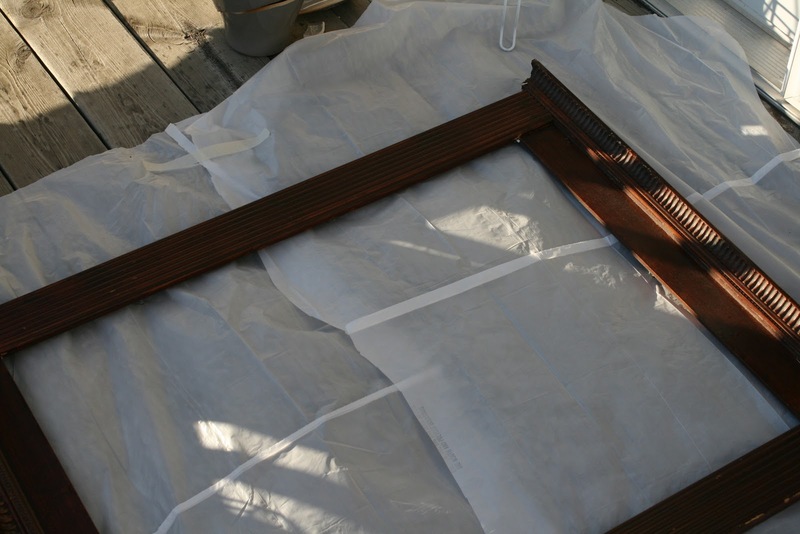 Dust your piece off, use some wood cleaner, clean the mirror, tighten the bolts, etc. You'll be shocked how much nicer it looks just from having had a nice clean! 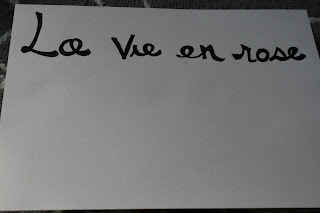 (2) Paint it. I literally spray painted this---on my apartment balcony!--- to perfection. 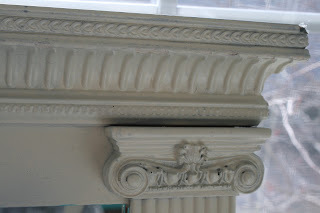 I used an antique white shade from Krylon. The paint I chose was indoor/outdoor + multi-surface. 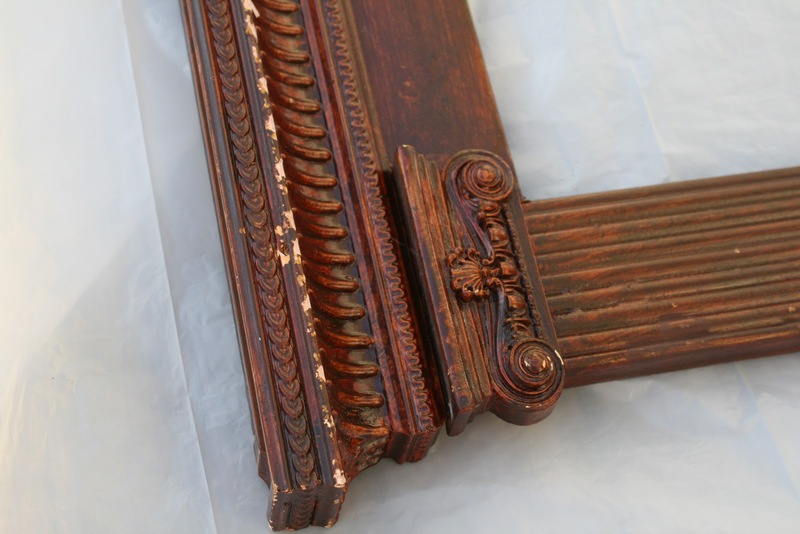 When you're buying antique you sometimes need the strong paint. You can't be sure what was used on it in the past. I could have sanded it down, but the woodwork was really intricate and I didn't want to mess it up. 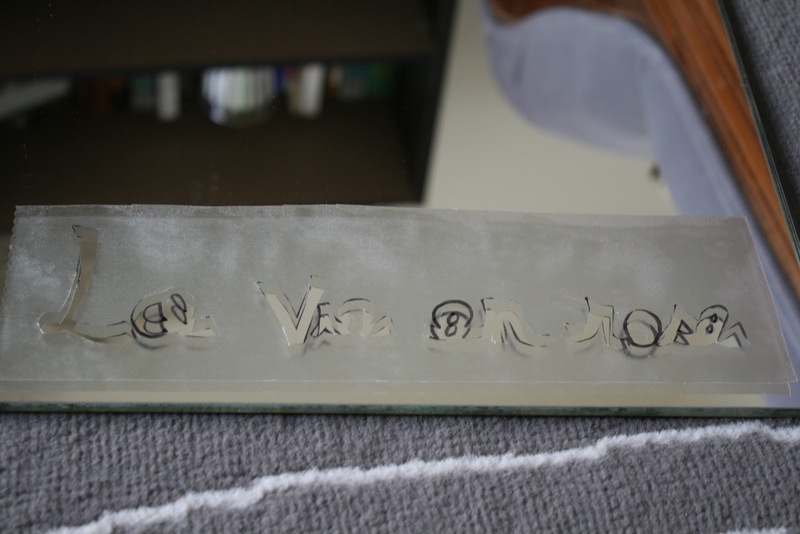 You can always prime something first :) in my case, three coats did the trick. Then I went back and kind of roughed it up a bit while it was still wet (third coat). I didn't want it to look too perfect. I wanted some of the brown showing through. I even pulled off the paint entirely in some areas. (3) Detail it. Add some spice. Use paint, textiles, wall clings, stencils, whatever you can think of or inspires you, to add some detailing to your piece. 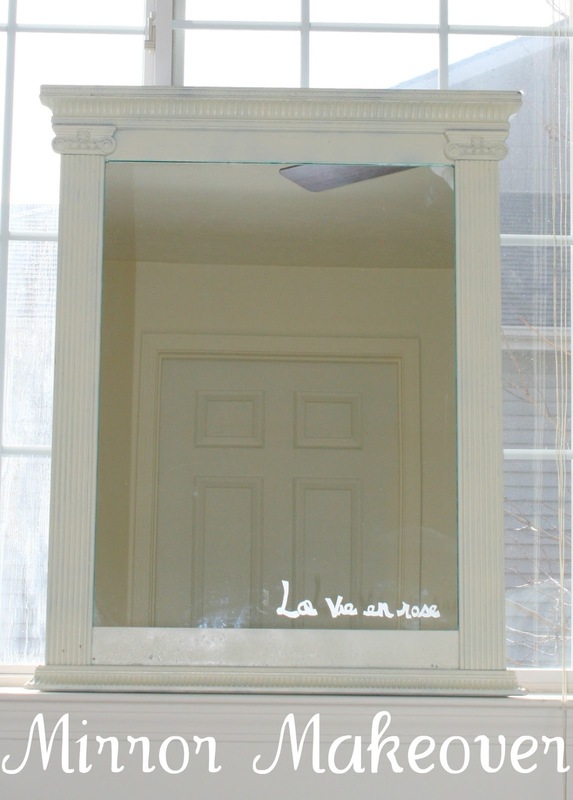 I didn't want to do too much to the woodwork on the mirror since it was sooo detailed already, but if you take a close look, you'll see that I rimmed the inside of the frame in a bright turquoise to match our bedroom. It's little, but in person it really pops. (4) Etch it. 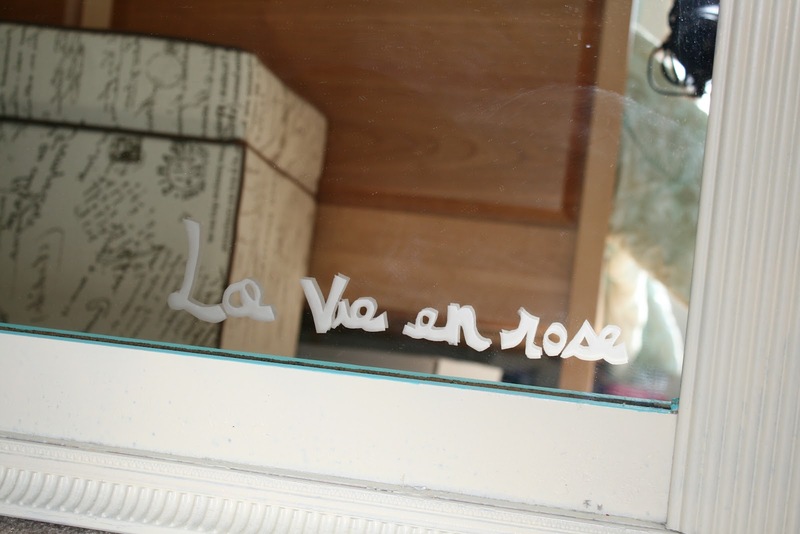 I followed my GLASS ETCHING METHODS and they worked perfectly on this mirror as well. 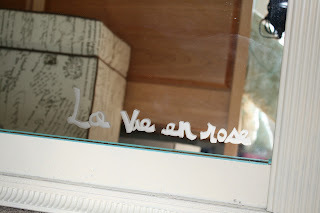 I etched in "la vie on rose", which is appropriate for a mirror. 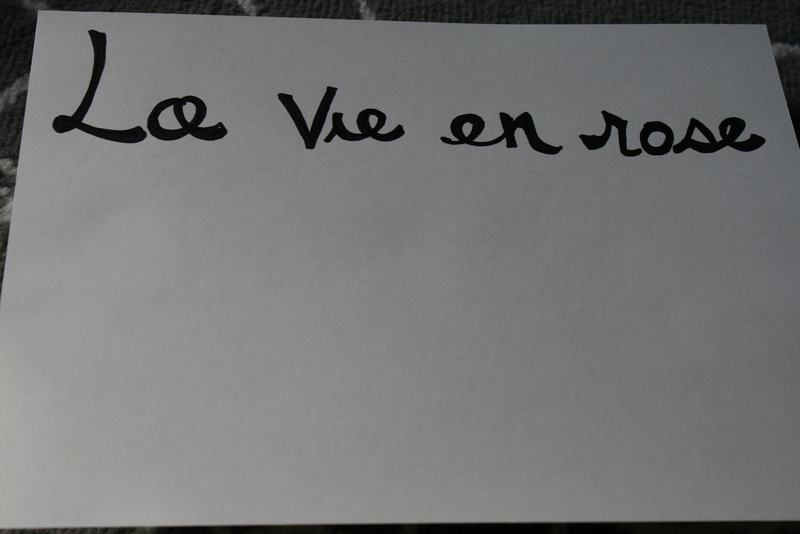 I may go back and add "Je vois" (I see) at the top. I haven't decided yet. That's it! It's minimal effort for maximum results. I love thrifting. The next time you head out to make donations at your local shop, I encourage you to take a look around and see what you might like to take home with you. You may end up with a perfect piece at a price you can't resist. 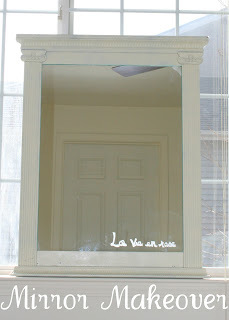 The total cost for me was $30 (mirror + paint). This mirror is MASSIVE and weighs about 30 pounds... it would be easily $200 at the store. Who needs new? Not me! Thanks so much for checking in to see how my little upcycling project went. Be sure to check back for more, as I've always got a few of these cooking at once! If you'll excuse me, I have a sweater to sew up next... but I wish you a wonderful day! And as always, thanks for reading!